RBTH presents a selection of views from leading Russian media on international events, featuring a report on the imposition of sanctions by Japan against the unrecognized republics in eastern Ukraine as Vladimir Putin prepares for a visit to Tokyo, as well as more analysis of Kiev’s decision to abandon its non-aligned status and seek NATO membership, and the significance of Ukraine’s ‘withdrawal’ from the CIS. The tabloid newspaper Moskovsky Komsomolets reports that Japan has imposed new sanctions against the unrecognized Donetsk and Lugansk people’s republics in the Donbass region of eastern Ukraine. The heads of the two breakaway republics as well as 14 organizations are on the Japanese government’s new sanctions list. However, Tokyo is hoping this step does not affect preparations for Russian President Vladimir Putin’s upcoming trip to Japan. 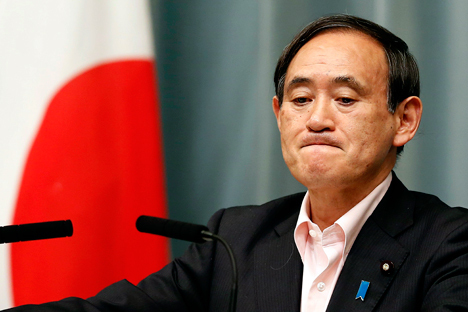 Japan’s Chief Cabinet Secretary Yoshihide Suga stressed that the sanctions are targeted against people and organizations that are directly connected with the recent unrecognized elections in eastern Ukraine and with destabilizing the situation in the region. He said a decision on Putin’s visit to Tokyo “will be made based on a comprehensive analysis of various factors” and confirmed that the Japanese and Russian leaders had decided during their November visit to Beijing to start preparing for the visit. Moskovsky Komsomolets writes that in September Tokyo adopted a fourth package of sanctions against Russia that toughen the procedure for exporting weapons and supplying military technology, and which ban the emission and distribution of securities by Sberbank, VTB, and other Russian banks on the Japanese market. Japan also suspended negotiations with Russia on easing the visa regime and put the brakes on talks about agreements to prevent dangerous military activity in space and to cooperate on investment. The daily broadsheet Kommersant writes that in the coming days Ukraine may waive its non-aligned status and set itself on a course toward joining NATO. Representatives of Ukrainian Prime Minister Arseniy Yatsenyuk’s People’s Front have drafted a bill to that effect. The document aims to remove the point about non-aligned status from the laws governing domestic and foreign policy and from the guidelines for Ukrainian national security. It also proposes adding a point about the prospect for NATO membership in those laws. According to Kommersant, most of the forces represented in the Verkhovna Rada have expressed support for joining NATO. Experts questioned by Kommersant are skeptical about the Ukrainian leadership’s plans. Kiev-based political analyst Mikhail Pogrebinsky drew attention to the fact that the leaders of key Western countries view Ukrainian membership in NATO as “extremely problematic.” “After the West has clearly voiced its position on the matter, such statements just discredit the Ukrainian authorities,” Pogrebinsky said. Political analyst Vitaliy Bala told Kommersant that a cancellation of Ukraine’s non-aligned status would act as another thorn in the side of Russian-Ukrainian relations and would not bring Kiev any closer to NATO. “NATO membership is not a question of tomorrow, but a strategic direction and a remote prospect,” the expert said. Experts agree that it would have no impact on the proceedings in Eastern Ukraine if the country were to drop its non-aligned status. The Ukrainian parliament, the Verkhovna Rada, may consider a bill canceling the validity of the Belavezha Accords in Ukrainian territory, the Nezavisimaya Gazeta daily reports. The Belavezha Accords are the agreement that declared the USSR dissolved and established the Commonwealth of Independent States (CIS). Ukraine cannot withdraw from the CIS because it was never a full member, since it never signed or ratified the CIS Charter. Therefore, the bill is essentially a political démarche by Kiev, the newspaper writes. Alexei Garan, head of the Political Science Department at the National University of Kiev-Mohlya Academy told Nezavisimaya Gazeta that the commonwealth, which was created as a tool for the “civilized divorce” of the USSR, fulfilled its mission long ago. “If the Verkhovna Rada votes in favor of the bill, the decision will have a symbolic meaning. In general, nothing will change,” Garan said. Garan said the CIS was not a platform for effective and mutually beneficial cooperation. Instead, it was a club whose members merely exchanged views. Moscow ended up creating several more comprehensive integration projects, such as the Common Economic Space, the Eurasian Economic Community, and the Customs Union. Ukraine will not participate in those organizations because it is focused on European integration, the political scientist added. Ukraine’s former envoy to the Eurasian Economic Commission Viktor Suslov told Nezavisimaya Gazeta that withdrawal from the CIS would also mean withdrawal from the CIS free trade zone. This, he said, is precisely what Russia was previously seeking in connection with Ukraine’s intention to sign an association agreement with the European Union. “Ukrainian products will become uncompetitive on the CIS markets, many companies will close, the state budget will lack revenues, the level of unemployment will grow,” said Suslov, predicting the economic consequences of the Verkhovna Rada’s potential decision.